Elba Island, where “nature” means “vacation”. The Elba island became famous for the Napoleon’s exile, and it is a green oasis in the Tuscan Archipelago, an island with different horizons: the golden beaches kindly touched by crystalline waters, cliffs kissed by wind, the earth, the scents , the tastes, the villages on the mountains, the castles, the terraces on the sea … all these aspects make you feel many things together: this is the Elba island. The excellent cuisine and the famous wines, such as the local one, Aleatico, with the taste of red fruits, are the symbol of a holiday in Elba, which is sweet, intense, sunshine and rich in nuances and with its unpolluted sea, the mild climate and the fresh air. This atmosphere makes Elba an ideal place for tourists all over the year, just to enjoy a “break” with the daily monotony and to spend some days on this island “out of time” . Here everything goes really slowly because in the island there is the Mountain Calamita, which is rich of iron minerals, and where there are many mines since the Etruscan period. The magnetism is the most remarkable caracteristic of this place, so that watches and mobiles lose their signal, and naval instrumentation lose their orientation by taking the Calamita Mountain as the magnetic north. So what are you waiting to leave home your watches and enjoy a holiday full of relaxation and fun, staying at Relais delle Picchiaie, because the island also offers a fabulous mix of cultural and recreational activities, including hiking, mountain biking, swimming, scuba diving and many other activities on the beach. All this makes a holiday on Elba Island as an unforgettable experience, or rather, a real life experience to discover the most hidden and charming places of the island with its colours and flavours. 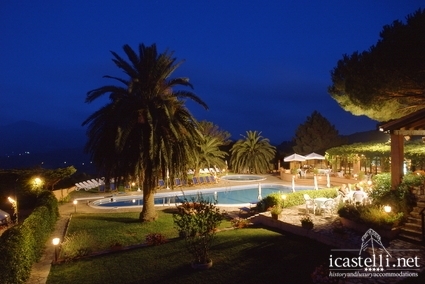 This entry was posted in Italy and tagged elba island holidays, holiday tuscany archipelago, Relais delle Picchiaie, sea holiday, vacanze al mare, vacanze arcipelago toscano, vacanze isola d'elba. Bookmark the permalink.